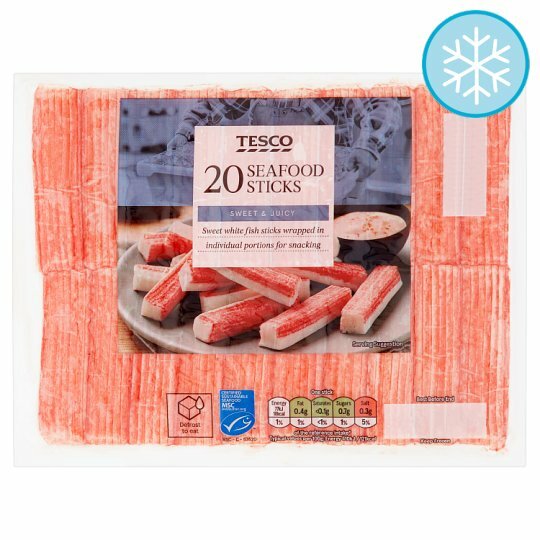 20 individually wrapped crab flavoured surimi sticks made with Alaska pollock (Theragra chalcogramma) and/or Pacific whiting (hake) (Merluccius productus) with added water and starch. Water, Surimi (35%), Wheat Starch, Potato Starch, Rapeseed Oil, Sugar, Salt, Dried Egg White, Flavouring, Crab Extract (Crustacean), Colour (Lycopene), Dried Egg. Surimi contains: Alaska Pollock (Fish), Hake (Fish), Sugar. Remove all packaging including outer wrappers.Ready to eat once defrosted.